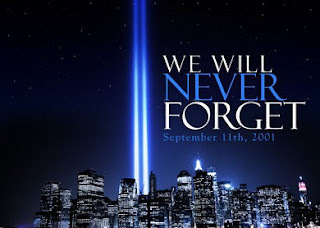 I will never forget the day of 9-11-01. I can tell you exactly where I was when I heard the news. We were across the country, yet it affected all us. The fear that gripped the world.......I can remember trying to reassure my students that everything will be okay. We eventually dismissed school. It just felt safer being at home. I will never, ever forget that day. I had the privilege to be in New York last year for the 10th Anniversary of 9-11. It was a dream come true. 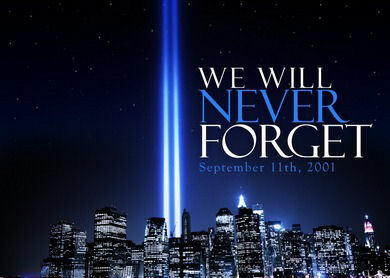 To be able to pay tribute to those that lost their lives. The 9-11 Memorial was remarkable. They grouped the names of the lost by where they were located. The Freedom Tower....it will be as tall as the World Trade Center. A magnificent building to show that they can destroy.....but Americans will rebuild! It was very touching to see each name engraved into the memorial. Each name representing a life that was lost. The two pools represent exactly where the world trade center stood before. Right across from the World Trade Center was FDNY Engine 10. They were they first responders and lost the most lives. A memorial was also set up here in memory of the firefighters. As we left the memorial's with heavy heart, we walked up this side street and I stood there and imagined what it would have felt like that morning. As you can see, the streets are very tight.......it would have very chaotic. Very scary. Not only did we get to see the 9-11 Memorial that week. We were able to go to the Pentagon Memorial in Washington DC, where one of the planes went down. A very awesome experience. Here the security was much tighter. No cameras until we got to the memorial area. This is the side of the building that the plane went into. Across from the building is a memorial area. They honored the lost with abstract art. The art almost looked like diving boards. Each memorial had a person that died inscribed on it. If the memorial was facing away from the building, that person was lost inside of the Pentagon. If the memorial was facing towards the building, they were on the plane that hit the Pentagon. Today we remember the lives that were lost......and I also want to remember the soldiers lives that have been lost since then. They continue to fight for our freedoms, so that we don't have to.